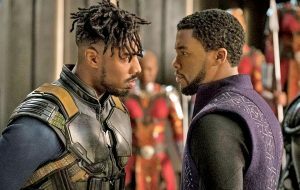 After his first two big-cat related superhero films – Pink Tiger and Burgundy Leopard – flopped at the box office director Ryan Coogler almost threw in the towel on his promising Hollywood career, but as with so many things persistence paid off and with his third bite at the apple, 2018’s Black Panther, he hit the cinematic jackpot. Taking $1.3bn at the box office and walking away with three Oscar’s, the usually understated Roger Ebert even described it as “transcending the superhero genre to emerge as an epic of operatic proportions”. Modest praise indeed. As you’ve come to expect from films that emerge from the Marvel Universe, Black Panther is wholly believable. There are commodities with magical properties that are worth fighting wars over, impenetrable battle suits made of that commodity, secretive hyper-modern African Kingdoms concealed from the rest of the world for thousands of years and a bad guy with a Nazi-back story that bears a weapon that’s able to create any kind of object or creature he can conceive of by using sound. Here you also still get the usual CGI-fest – though the battles are relatively uncluttered and smaller than usual – however as one of Marvel’s most mature films, as well as perhaps its most political, you also get a whole lot more. Particularly about race. I’m white so I can’t easily comment on this aspect but Time Magazine’s Jamil Smith summed it up well in 2018 when he said “…it hasn’t even hit theatres yet and its cultural footprint is already enormous. It’s a movie about what it means to be black in both America and Africa—and, more broadly, in the world. Rather than dodge complicated themes about race and identity, the film grapples head-on with the issues affecting modern-day black life. It is also incredibly entertaining, filled with timely comedy, sharply choreographed action and gorgeously lit people of all colours”. Amusingly the invite for the premier read “Royal attire requested” which instead of seeing the stars dress like the cast of a BBC period drama saw them donning head wraps made of various African fabrics, Afrocentric patterns and African clothing including dashikis and boubous. Daniel Kaluuya, an Oscar nominee for his performance in Get Out (which we screened at Brockwell Lido in 2018) arrived wearing a kanzu, the formal tunic of his Ugandan ancestry. Black Panther, the most significant film of the past year, opens our festival on 2nd May. It’s screening in the room above Herne Hill Station at 7:30pm, and don’t worry, we’re not requesting Royal attire… if we did you might not get your headdress up the staircase!